Pleasantly OK, but with major errors in judgment. Tasting Menu (Spanish and English, with English subtitles) is about a closing best restaurant on the coast of Barcelona and the final exclusive dinner prepared for thirty diners who have had reservations for one year. Vicenta N’dongo (Mar Vidal) goes on a talk show to glibly talk about her departure, and for some reason, turns out to be in the film way less than the diners. Marc and Rachel (Jan Corner, Claudia Bassols) are the leading attractive couple, separated from marriage due to career and conflicts, who have reunited for the restaurant’s close – they’re so pretty you might want to eat them. 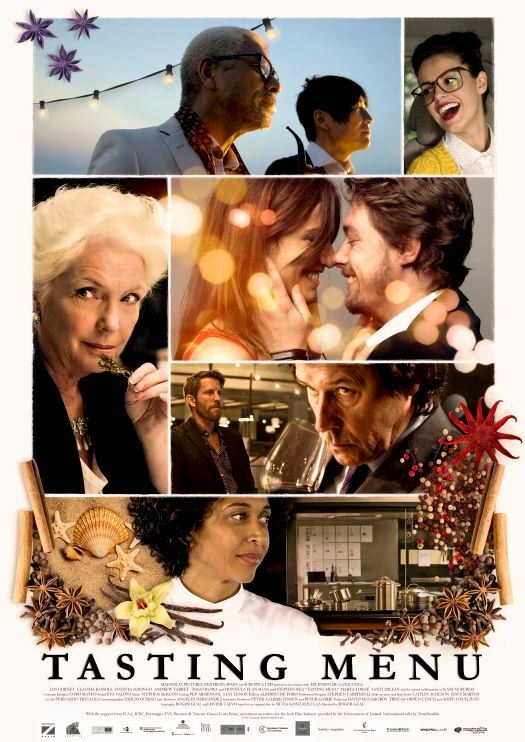 Blabbermouth Mina (Marta Torne) mistakenly takes Marc for a romantic single, then there’s the lonely widowed Countess (Fionnula Flanagan), and the feared restaurant critic (Stephen Rea). Oh wait, there’s more. Also a couple of Japanese investors, an arrogant American who likes Rachel, and the worried restaurant host concerned, I think, about where his career will go next. This cast of assorted libertines and worrywarts are an affable group, I assure you. But the film commits a cardinal sin: When you make a food movie, an audience wants close-ups of the food! “Tampopo,” “Babette’s Feast,” “Like Water for Chocolate,” “Big Night,” “Eat Drink Man Woman,” “Dinner Rush,” “Julie and Julia,” etc. The characters of “Tasting Menu” are nice, but director Roger Gaul mistakenly thinks we came to watch his movie because we will care more about silly soap opera stock characters more than the food. Many shots of Gual’s film could have been improved had he taken the camera from peoples’ faces and panned downwards at the plates. Shaky, fleeting shots of the food is all you will get. Also, not enough shots of the scenic Barcelona coast – why go through the trouble of landing in this location and not exploiting it? A sinking boat that holds the exclusive dessert is also not physically seen, only heard about. “Tasting Menu” is the cinematic equivalent of a lazy mindless meal that’s companionable but unmemorable. I kind of enjoyed it on a shallow chore level, but it made me want to go home and eat something that I could see in front of my face. 85 Minutes. Rated PG-13. Spanish in English subtitles. Film Cousins: “Tampopo” (1985, Japan); “Babette’s Feast” (1987, Denmark); “Big Night” (1996); “Dinner Rush” (2000).